Everybody loves to win swag, but we’ve found a contest that is offering a serious collector’s item for a prize. Read on for a chance to win the original manuscript from Jack Ketchum and Lucky McKee’s newest collaborative effort, I’m Not Sam. Now that’s a prize! Entitled the Jack Ketchum and Lucky McKee Naughty and Nice 2012 Holiday Giveaway, entering this contest is as simple as pre-ordering a copy of the book and forwarding your order confirmation along to the proper address. For more information, check out JackKetchum.net, or Cemetery Dance Publications and Sinister Grin Press. Also, be sure to follow Jack Ketchum and Lucky McKee on Twitter at @JackKetchum and @LuckyMcKee. 1. Preorder/purchase a copy of I’m Not Sam by Jack Ketchum and Lucky McKee before the clock strikes midnight on November 30, 2012. 2. Forward a copy of your order confirmation to: IMNOTSAM@JackKetchum.net. One entry will be selected at random and the winner will be notified via email, and you’ll have the prize in your hands in time for the holidays. WHERE CAN YOU PREORDER/PURCHASE A COPY OF I’M NOT SAM? 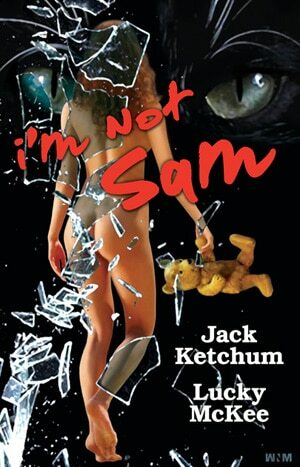 I’m Not Sam by Jack Ketchum and Lucky McKee will be available in a deluxe signed and tray-cased lettered edition ($200), a signed limited, ($40.00), and a trade hardcover ($17.99) from Cemetery Dance and trade paperback ($10.00) from Sinister Grin Press. It doesn’t matter which edition you buy, as long as you preorder/purchase at least one from either Sinister Grin Press or Cemetery Dance. If you buy two copies, one for yourself and one as a gift, you’ll receive one entry for EACH copy you preorder/purchase, as long as you send your order confirmation to IM NOT SAM before 11:59 ET on November 30, 2012. Buy two copies, get two entries, and so on and so forth. Find your identity in the comments section below!